Residents say troops from Somali armed group have overrun AMISOM base in Janaale, south of capital Mogadishu. Al-Shabab fighters in Somalia have killed "scores" of African Union troops in an attack south of capital, Mogadishu, a spokesman for the armed group told Al Jazeera. 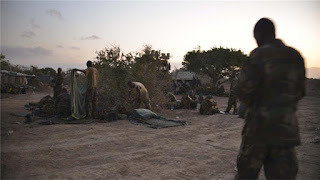 The attack in Janaale, in the country's Lower Shabelle province, early on Tuesday was confirmed by residents, but an exact casualty figure was not immediately available. The assault involved the use of a car bomb, which breached the defences at an African Union Mission in Somalia (AMISOM) base in Janaale, residents told Al Jazeera. Heavily armed fighters then stormed the base killing about 50 soldiers, mainly from Uganda, according to al-Shabab's spokesman. There was no word from the African Union or Somalia's government on the attack. In July, al-Shabab claimed to have killed "dozens" of AMISOM troops at an outpost in Lego, about 100km northwest of the capital. The attack on Lego also began with a suicide car bomb, followed by an assault by members of the armed group. Al-Shabab fighters used a suicide car bomb to attack an African Union force base early Tuesday in Somalia's Lower Shabelle region, then stormed the site and engaged in a firefight with troops. The militants claimed they killed dozens of troops and seized the base in Jannaale, which the African Union Mission in Somalia (AMISOM) denied. "AMISOM can confirm that the base is still under AMISOM control," it said on Twitter. "Reports that the base has been taken over and our weapons captured are false."